I look forward to another year of racing and fun in 2019. I would like to thank you for your participation in our racing program. 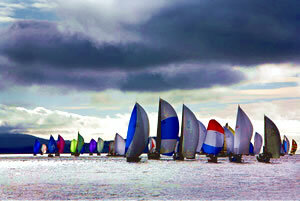 The number of boats that continue to show for our events is remarkable and helps make it even more fun on the water. The overall awards for the year have an attendance component to reward those that support the club through their participation. The racing program, much like the club, is run by our contributions as volunteers and there are plenty of opportunities to contribute to our success. Volunteering is also an excellent way to get to know other club members who are like-minded in what they choose for fun.The schedule of races planned is full of events to continue improving our sailing skills while enjoying the beautiful Puget Sound with friends. Once again, thank you for the continued support of the racing program and please don’t hesitate to let me know if you have any ideas for ratcheting up the fun. I look forward to seeing you out on the water! It's easy to Volunteer!! Members, please log in first. Click Volunteering in the menu. 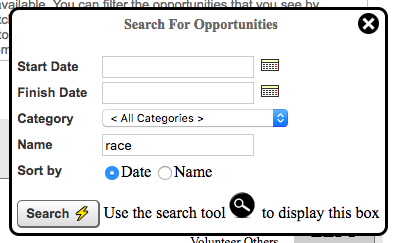 Click the little magnifying glass to search and enter "race" in the name field. Nothing else, just type the name "race" without quotes. You'll be presented with all volunteer slots both open and filled for the upcoming Wednesday Night Racing Series. Helpful Documents Tips for cooking for 100 and How to Run a great race. Results Archive Who won 5 years ago?